Join us on this great value trip as we discover the highlights of Peru including its impressive mountain citadel, Machu Picchu. We sail on Lake Titicaca, visiting the Indian communities on Uros and Taquile Islands, where we overnight with a local family. We also discover the colourful cities of Cusco and Arequipa and search for condors at the majestic Colca Canyon. Join the tour in Lima and check-in at the hotel. Departing Lima early this morning we board a modern public coach south, following the Pacific coastline, before turning towards the fertile mountain valleys that lie around town of Nazca. Our journey around seven hours and brings us through some of the driest desert regions on earth. Here we find the winegrowing landscapes of the Ica Valley, a region that produces some excellent vintage, as well as Peru's distinctive local tipple, Pisco, a particularly potent mix made from the white grape. Our final destination for today is the oasis town of Nazca, lying in the shadow of Cerro Blanco, which, at over 2000m, is the highest sand dune on earth. We arrive in the early afternoon and the rest of the day is free to relax or explore Nazca. Some specialists have speculated that the Nazca Lines represent the world's largest astrological calendar. Huge birds, spiders, whales, other creatures and geometrical figures are represented in outline. Here we have several options to spend the day. You have chance to climb nearby viewing platforms for views out over the lines etched into the desert. Or maybe visit the nearby Antonini Archaeological Museum, the Chauchilla pre-Inca cemetery or the Nazca aqueduct. Alternatively, you could do a full day tour of the area with a local guide, including all of the above, along with the historical Acueductus de Cantalloc, the Inca ruin of Los Paradones and a local pottery workshop. After dinner today we board the coach for our overnight journey, continuing south through the night towards the city of Arequipa and the volcanic landscapes of the Andean Mountains. Our coach is very modern, with good sized reclining seats and TVs on board, as well as a well-maintained toilet. Blankets are also provided - it's a comfortable way to travel long distance in Peru. We arrive in Arequipa this morning at around 9am. This beautiful city is spectacularly located at the foot of the volcanic slopes of El Misti, a perfect conical peak that rises to some 5822m above this grand colonial city, The city itself was founded by the Spanish in 1540, on the site of an old Inca settlement, and today is famed for its colonial architecture, including what is arguably one of the finest arcaded city squares anywhere in the Americas. Arriving this morning we will transfer to the hotel, after which the rest of the day is free to explore at your leisure, perhaps taking in the elegance of the Plaza de Armas and its immense twin-towered cathedral. You might also like to visit the striking 17th century churches of La Compania and San Agustin and the colonial grandeur of Casa de Moras, or perhaps pay a visit to the extraordinary Santa Catalina Convent, a miniature walled town in the heart of the city, which once housed 450 nuns and serving ladies in total seclusion for nearly 4 centuries. Riddled with a network of cobbled streets and lavishly restored with period furnishings and beautifully ornate touches, the convent is without doubt one of the highlights of any visit to the city. Other recommended sights are the old university and the archaeological museum, which has a fine collection of ceramics and mummies. Otherwise you may choose to take a seat at one of the cafes overlooking the main square and watch the comings and goings. After breakfast today we travel to Chivay by private bus. Our journey takes around six hours and brings us into the world of the Altiplano, passing behind the volcanoes that ring Arequipa and on to Chivay. There are herds of llama and alpaca en route, and if lucky we may spot the elusive vicuña. We cross the Patapampa pass with a brief stop at the trip's highest point (4910 m) before beginning our descent to the town of Chivay. On arrival we have a late lunch and the afternoon is free to perhaps bathe in the hot springs (optional). This morning we visit the Colca Canyon. A spectacular river gorge, the Colca Canyon measures twice the depth of the more famous Grand Canyon and at one time it was believed to be the deepest gorge on earth (until it was eclipsed by the deeper Cotahuasi Canyon). Largely unknown to the outside world until the latter years of the 20th century, today it affords us an opportunity to discover a world of Andean villages and Inca terraces that make up one of the most outstanding natural settings in the Americas. This is the world of the Altiplano, where the Rio Colca meanders through a landscape of towering volcanic peaks that offer a stunning backdrop to a land inhabited by Cabana and Collagua Indians. Home to the massive and majestic Andean Condor, these awe-inspiring vistas derive their name from the old Incan practise of storing harvested grain in natural vaults carved into the canyon walls, vaults that the Indians called colcas. This afternoon we drive east, heading towards the beautiful landscapes that surround the unique waters of Lake Titicaca, the highest navigable lake in the word (3856m). Our destination is the town of Puno, a centre of Incan folklore nestling in a bay at the northwestern tip of the lake and the perfect base from which to explore something of the cultural and historical significance of the lake itself. From Puno we take a boat trip on Lake Titicaca to explore the floating reed islands, home to the Uros people who live on the lake itself. Their islands are made from totura, a reed-like papyrus that grows in the shallows and is used in most aspects of their life, including the construction of their boats and homes. We then continue to the less visited island of Taquile which has preserved much of its Inca and pre-Inca heritage and the islanders still speak the language of the Inca - Runa Simi or Quechua. We take our time walking across the island and we will have the chance to buy locally produced embroidery - the men's handiwork for once. This evening we stay in a local village house on the island. This morning is free on Taquile Island to make the most of a setting where the local people still preserve a rich tradition of music and dance. You might like to take a walk up to the Inca ruins , or visit the market, presenting an ideal opportunity to buy some of the locally made embroidery that is produced by the men of the island. Later this afternoon we then return to Puno by boat, where we can take a stroll through the markets in search of excellent llama and alpaca wool items. 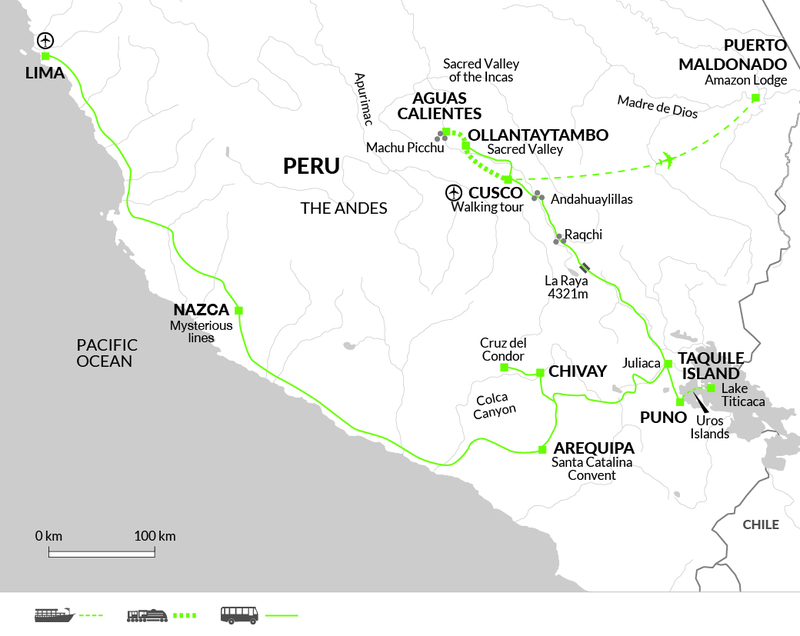 Today we follow the legendary route taken by the first Inca ruler - Manco Capac - on his way to find Cusco, passing through a landscape that is both desolate and magnificent, where flocks of llamas and alpacas graze amongst the windswept meadows. Rising early, we head to the public bus terminal where our coach awaits us. During the ten hour bus trip, we make several stops including at the small market town of La Raya, and the Inca ruin of the Temple of Wiracocha in Raqchi. Traversing the northern extremes of the Altiplano, we cross the La Raya pass (4321m) and the continental divide, before beginning the descent towards Cusco along the Rio Vilcanota. We arrive into the fascinating city in the late afternoon and check into our hotel. Alternatively you may wish to take the classic Titicaca train journey from Puno to Cusco (optional) - one of the great railway journeys of the world, the full day journey covers some spectacular scenery over the high altiplano. This includes a sumptuous meal aboard the train, with perhaps the chance to try some local delicacies before we arrive in Cusco in the late afternoon and head to our hotel. Please note that rail strikes are common in Peru and so there is the possibility that the train may not always be running. In the event that you have chosen the optional train ride and it is not operating, then we will make the journey from Puno to Cusco by bus, with the rest of the group. Refunds due to trains cancelled due to strike action is at the rail companies discretion. The old capital of the Inca Empire, Cusco is the archaeological capital of the Americas and the oldest continuously inhabited city on the continent. Imbued with an atmosphere of mystery and grandeur, the Spanish-style city of today, with its attractive pink tiled roofs, arcaded plazas and steep winding alleyways, stands upon tremendous Inca foundation stones, its links with the Inca Empire everywhere to be seen, from the stone walls that line the city streets, to the museums filled with artefacts and relics of a long dead people. This morning we make a short orientation tour of the city with the tour leader pointing out the key sites, before some free time to continue exploring further. We will see the rich majesty of the Plaza de Armas and the incredible remains of Qoricancha, once the heart of Inca society. The city itself is filled with monuments to its more recent colonial past too, with churches and galleries in abundance, making it an ideal city to enjoy at your own pace (entrance fees not included). An interesting site is at the Inca wall of Hatunrumiyoc with its famous twelve-sided stone (its typical bevelled joints creating the patterns of light and shadow so typical of Incan walls). the most spectacular feat of engineering in ancient America. The rest of our time is then spent in this magnificent city, dividing our time between a guided tour (4 hours) and some free time to explore these spectacular ruins privately. Temples, stairways, palaces and gabled stone dwellings are scattered everywhere, testifying to the energy and ingenuity of the builders. Not without reason is this site probably the most revered tourist attraction in the Americas; its location alone is dramatic in the extreme, teetering on the saddle of a high mountain peak that towers above the valley below. Built in the mid 15th century by Pachacuti, the city was thought to have been a major agricultural centre for the Incan Empire and its inaccessibility seems to have preserved it from the looters of the intervening years, resulting in the remarkably well-preserved ruins that we see today. Returning by bus to our simple accommodation in Aguas Calientes, situated on the valley floor below, this evening then affords a chance to relax in the local thermal baths (optional). We have another chance this morning to explore the site. It is also possible to climb the steep peaks of either Machu Picchu Mountain or Huayna Picchu Mountain to look down on the citadel. Machu Picchu Mountain is a 700m climb from the top of the citadel. There are cobbled stairs all the way up with a few eye-opening drops in some parts, and the round-trip takes about 2.5-3 hours. Huayna Picchu Mountain is only 350m, half the size of Machu Picchu Mountain, but much steeper. There are many more sheer drops, and it is definitely not suitable for someone with a fear of heights. For those who fancy doing the 1 hour climb, you'll be rewarded with world-beating views of Machu Picchu, and the feeling that you're standing on a precipice at the top of the world. This must be pre-paid at time of booking. If you change your passport between your time of booking and prior to travel please take your original passport with you. Later we take the afternoon train to Cusco. With a full free day in Cusco there's the chance to go white water rafting on the Urubamba River; grade 2-3 (optional and seasonal), or perhaps visit the market town of Pisac, strategically located at the head of the Urubamba Valley (optional). Pisac once controlled the road connecting the Inca Empire with Paucartambo on its eastern borders and the magnificent Inca ruins that once so dominated this valley still occupy the mountainside above the town, providing a worthy match for any of the temples of Machu Picchu. Other alternatives include a full day visit to the outlying Inca sites at Qenqo, Puka Pukara and Tambo Machay, or maybe a visit to the fortress-citadel of Saqsaywaman. Built to defend the Inca capital, Saqsaywaman broods high above the town, its huge, zigzagging stone walls broken into 66 sharply projecting angles to catch attackers in a withering crossfire. Meant to represent the head of a puma, 20,000 conscripted workers toiled for 90 years to finish it and it was the site of one of the most fiercely fought battles of the Spanish conquest, when the Incas made one last ditch attempt to drive out the Spanish, an attempt that ended in defeat and death for thousands of them. Otherwise you may want to chill out in Cusco and enjoy the atmosphere of this lively town. Today we transfer to the airport for a short flight to Puerto Maldonado, located in the Southern Amazon area of Peru (your Tour Leader stays in Cusco). You can leave your main luggage in Puerto Maldonado and just take with you what you need for the next few days. The Amazon comprises 60% of Peru and the Peruvian Amazon is the second largest section of the Amazon Rainforest after Brazil. The Amazon basin covers two fifths of South America over many countries including Bolivia, Brazil, Colombia, Ecuador, Guyana, Peru and Venezuela and it is the most bio-diverse environment in the world. Most of the basin is covered by the rainforest, which is the largest rainforest in the world. We travel along the Tambopata River by motorised canoe (approximately 40 minutes) and check into our Amazon lodge. We have a short stop at the lodge for a buffet lunch before our local guide takes us on an exploration of the jungle trails surrounding the Field Station, discovering the tropical trees, medicinal plants, insects, butterflies and other animals we see en route. In the evening, we have a night float along the Madre De Dios River in search of the wildlife that surface during night time such as capybaras, white caimans and nightjars. The lodge is comfortable but as it is in a remote location, the electricity is provided by a generator and is only available for certain hours of the day. We spend the morning on the Inkaterra Canopy Walkway, which is a 1129ft system of 2 observation towers, 8 platforms and 7 hanging bridges 100ft above the ground. The walkway is designed to perform scientific research of the ecosystems inhabiting the rainforest canopy, and gives us an unobstructed view of the wildlife and birds. During the afternoon, we take 30 minute boat ride, entering the territory of the Tambopata- Reserve. We will trek 5km through the dense vegetation of the tropical rainforest looking out for snakes, monkeys and birds. Our destination is Sandoval Lake. Numerous species of animals live near the lake, keep your eyes out for kingfishers, cormorants, squirrel monkeys, and capuchin monkeys. At the lake itself we may see giant river otters, black caimans and piranhas. This is also the habitat of the giant arapaima, a fish of more than 2.5m, weighing in at more than 200kg. This morning, we take a 20 minute boat ride to the river island near our lodge, a large sandbank at the shores of the Madre De Dios River. With our Local Guide, we will walk across the island to explore the floodplains that provides the island an ecosystem with a great diversity of birds such as the Amazonian umbrella bird, one of the Amazon's most sought after species by birdwatchers. We continue on to visit the Inkaterra Association's Bio Orchard, where organic native goods are cultivated such as palms, vegetables and fruit. We learn the diverse phases of sustainable horticulture, the preparation of recycled compost, sowing and harvesting vegetables, fine herbs and tropical plants, using natural fertilizers, pesticides and herbicides. The lodge is working as sustainably as possible, to help local communities protect their surroundings, and using the forest for good. During the afternoon, our Local Guide will show us the permanent plot area for rainforest restoration and conservation, and we'll learn about the survival mechanisms of the rainforest, exploring the meanings of the 19 native palm species. We'll take a night walk through the jungle, listening to the sounds of the birds, mammals, insects and amphibians that wander the forest at night, using the expertise of our local guide to try and spot them. Our Amazon adventure comes to an end today after breakfast and we will travel by motorised canoe back to Puerto Maldonado, before transferring to the airport. If you prefer you can end your trip at the office in Puerto Maldonado and arrange a taxi transfer to the airport yourself at a time that better suits your own itinerary. The office is a short taxi ride from the town, and about 20 minutes by taxi from the airport. There is a rainy season from Dec - Mar however on the coast it rarely rains. Jun-Oct is damp and misty, but temperatures never drop below 10°C. At high altitudes although there are sunny days temperatures can drop dramatically, and conditions can change suddenly. Puno - Titicaca Train £190, subject to availability and cost may fluctuate depending on demand. This must be pre-paid at time of booking and is non-refundable. If you change your passport between your time of booking and prior to travel please take your original passport with you to avoid being fined. Aguas Calientes - Thermal Springs US$ 4. Machu Picchu - second entry US$ 70 plus bus to entry US$ 25(bus paid locally) Huayna Picchu Mountain - £80; Machu Picchu Mountain £80 (both including transport) - Subject to availability - these must be pre-paid at time of booking and is non-refundable. If you change your passport between your time of booking and prior to travel please take your original passport with you to avoid being fined. The highlands enjoy dry sunny days but extremely cold nights so thermal underwear, a well insulated fleece/jacket and a thick jumper are essential. Bring something warm to sleep in. A light raincoat is recommended. A sun hat and sunglasses are advisable as is high factor sunscreen, due to the thinness of the atmosphere. Bring a swimming costume for the thermal baths at Aguas Calientes. For your jungle extension, you can expect warmer and more humid conditions. However, there may also be heavy rain showers (it tends to be cooler and drier between May and October). Bring light and loose clothing - long sleeved shirts and long trousers are best when walking through jungle, and a lightweight rainjacket. The warmer clothes from your time in the mountains may also come in useful during the evenings, in case of cool weather. One main piece and a daypack plus one small overnight bag for your nights in Aguas Calientes and on Taquile Island. On Taquile, your main bag will be left in Puno while you stay on the island for one night. In Aguas Calientes, your main bags will be left in storage in your hotel in Cusco, and will meet you on your return to the city. On the Amazon Extension, due to limited space on the boats your luggage will be limited to 10 kilos - your main bag will be left in Puerto Maldonado while you stay at your Amazon Lodge. There will be time before departing Cusco to re pack enough for four days including clothes, toiletries, shoes, torch, sun cream and insect repellent. Remember, you are expected to carry your own luggage (i.e. on and off transport etc.) so don't overload yourself. It is recommended you bring lockable bags. A good insect repellent is essential. Also bring a small torch, sun hat, sunscreen and a swimsuit and a small towel (for rafting and thermal baths). Please note drones are prohibited in most tourist areas in Peru. A good torch and spare batteries for night walks and when the generator is not on. Although entirely voluntary, tipping is a recognized part of life in this region of the world. Some local staff will look to members of the group for personal recognition of particular services provided. In order to make things easier for you, your leader may organise a group's tips kitty for included activities and meals and if this is the case, they will account for it throughout the tour. Local currency in Peru is the Nuevo Sol. You can choose to either change your money in advance or on arrival at the airport. Here you will find both ATMs and Bureau de Change. ATMs can also be found in the major towns and cities for cash withdrawals in Nuevo Soles. We recommend you take some emergency cash in USD as the GBP exchange rate isn’t very good. Notes should be in good condition otherwise they might be difficult to exchange. During this trip we spend one night in a homestay on the island of Taquile, on Lake Titicaca. The homeowners will cook for us and we are able to experience life on the island. Rooms are simple but comfortable, and there are several toilets for communal use. It's a very serene, quiet place and for many it is one of the highlights of their stay. The guest accommodation at Inkaterra Field Station although simple, is built to a high standard. Built within the Inkaterra Ecological Reserve, an area of over 10,000 hectares of virgin forest, the Field Station was originally set up as a research centre for scientists and has now opened its doors for travellers to experience the Amazon rainforest. The Field Station is ran by, and is the headquarters for, the Inkaterra Association, an NGO funded by Inkaterra's ecotourism activities which is dedicated to supporting, fieldwork, biodiversity research and conservation. The communal area and dining room is a wooden structure with a high roof, thatched in traditional style with palm fronds. The Cabanas rooms are a short walk from here and are also built in local wood, blending in with the surrounding forest. They each have an outdoor terrace with seating and are all furnished with crafted wooden furniture and, en-suite bathrooms equipped with a cold (lukewarm) water shower, basin with running water and flushing toilet. There is also a safety box for storing valuables and food. The design of the buildings allows the rooms to be naturally ventilated - the rooms are elevated off the ground and have high unsealed thatched roofs that encourage air-circulation. Good mosquito nets cover the beds (which are well off the floor) and there are ceiling fans. Electricity is provided by a generator twice a day so Wi-Fi and room lights can be used, batteries charged, etc. but a strong torch is also required. Meals are all included during your stay and combine delicious local produce; lunch and dinner are served in the communal area self-serve style. Boiled, filtered drinking water is also available at all times, as is tea and coffee. Fruit juices are provided with breakfast, and beers, Pisco and soft drinks are also available to buy at the bar. The Inkaterra Explorer guides all have a recognised national guiding qualification and most are from the local area. During your stay they will help you explore the primary forest around the lodge, identify animals and plants, and learn about the biodiversity and local way of life. Keep your eyes open as you travel around by boat or walk through the forest as there is abundant wildlife in the area around the lodge. Peru: Visas are not required for UK, New Zealand, Australian, US and Canadian citizens. Other nationalities should consult the relevant consulate. We have specifically designed this itinerary to allow you to acclimatise gradually against the symptoms of altitude sickness, a common and usually harmless condition caused by reduced air pressure and a lower concentration of oxygen. At altitudes of over 3000m, minor symptoms such as headaches and shortness of breath are commonly experienced for a day or two, and there is no preparation that you can do for this. Symptoms aren't related to general fitness. The best remedy is to rest, not ascend any further and ensure that you're well hydrated. If the symptoms persevere or get worse, then the main course of action is immediate descent. If any symptoms do occur - whether minor or more severe - then you should let your Explore Leader know immediately. As this tour reaches altitudes of over 4000 metres, we strongly recommend that travellers with heart or lung conditions, anaemia, asthma, high blood pressure or on the pill should seek the advice of their GP. Please also ensure that your insurance policy covers you to the maximum altitude of 4910m. Nothing compulsory, we recommend protection against typhoid, tetanus, polio and hepatitis A. Please consult your travel clinic for the latest advice on Malaria, Dengue and Zika Virus. Please take preventative measures to avoid mosquito bites - these include mosquito repellent as well as long trousers and long sleeve shirts to cover up when necessary. Please note many countries in Central America, South America and the Caribbean require a yellow fever vaccination certificates if travelling from infected areas. A detailed list of these countries can be found on the NaTHNaC website - http://travelhealthpro.org.uk/countries. Also on the NaTHNaC site there is a list of Countries (and specific areas within a country) which are at risk of infection and a vaccination is therefore recommended. Please check the latest requirements with your travel clinic or doctor prior to departure. The above is not an exhaustive list. Further information regarding vaccinations and travel health advice can be found by following the NHS and NaTHNaC links at Explore Travel Health and from your local healthcare provider. Visa and vaccination requirements are subject to change and should be confirmed by you before travelling. With simple hotels in places, and one overnight journey, this is a great way to see Peru on a shoestring. The overnight coach is very modern, with good sized reclining seats and TVs on board, making it a comfortable and economic way to cover long distances and see as much as possible. With plenty of options for both thrill seekers and archaeology or culture lovers, this trip gets to the heart of Southern Peru.